Crunchy and fresh, this salad is a delicious recipe. 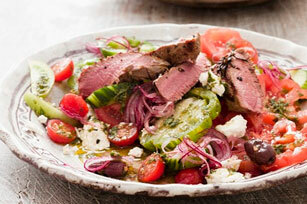 Charred steak, juicy tomatoes and savoury feta, all tossed with delicious dressing - yum! Heat olive oil in medium skillet over medium-high heat. Add steak and cook 8 min., turning after 4 min. (145ºF) or until desired doneness is reached. Remove from heat, place on cutting board and cover loosely with foil. Let stand 5 min. Slice into 1/4-inch slices. Place tomatoes, cucumber, feta cheese and olives on large serving platter. Top with steak and drizzle with dressing before serving. Top with 1/4 cup sliced red onions.